It's been 4 years since the debut CD by the Rob Garcia 4 and 2 since the band's 2nd effort. 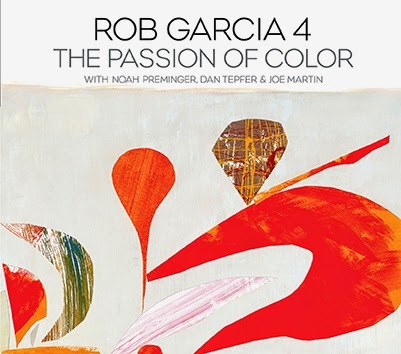 "The Passion of Color" (Brooklyn Jazz Underground Records) is the 3rd release featuring Garcia (drums), Dan Tepfer (piano) and Noah Preminger (tenor saxophone) with bassist Joe Martin joining the band (Chris Lightcap was on the 1st and John Hebert on the 2nd). What has always impressed about Garcia's music is how equally important melody and rhythm are (not one above the other.) There's nothing radically changed on this date but, if anything, the ensemble is tighter. Garcia pushes his soloists on the up-tempo pieces; the title cut drives with such intensity especially during the very tenor solo. Preminger has often accentuated his "softer" side but here he delivers quite a forceful solo. Tepfer takes a more impressionistic approach which allows the leader's sparkling cymbal work to stand out. Dig how the 4-some transforms Max Roach's hard-edged "It's Time" into a medium-tempo ballad, imbuing the piece with more of a blues feel. Garcia's short drum solo is notable for his melodic sensibility and staying "in the mood." As a composer, Garcia writes to the strengths of his band. Preminger's tenor on "Purple Blush" explores the melody in the style of Archie Shepp, short shards of melody in sync with the rhythm section. Meanwhile, Tepfer is both melodic and abstract, downright bluesy too. The playful rhythms of "The Caterpillar Vs. The Butterfly" gives the quartet plenty of room to maneuver in and around the propulsive bass lines (Martin "runs" not "walks") and the skitter, jittery, drums. The pianist channels Bud Powell as he slides around the bass and drums. Garcia's splendid brush work sets the proper mood on "The Garden's Poet", a short tune that shows that everyone in the group can play melodies in support of each others. The disk comes to a close on 2 fascinating tracks. Speaking of melody, Garcia gives himself the spotlight, going it alone on "The Painter", delivering a drum solo that both swings and sings. Then, Martin's full-tone bass lines lead the band in on a first-rate reading of Jimi Hendrix's "Little Wing." No one holds back, each member of the group digs deep into the modern blues that the composer created nearly 5 decades ago and, although the piece is fairly quiet, there is an intensity of emotion that is palpable throughout. The Rob Garcia 4 uses an impressive musical palette to create "The Passion of Color." The trust that the members of the group have with each other and the material provides the listener with an aural experience that satisfies on many levels, continuing to do so on subsequent listens. And, as good as the recording is, the RG4 are a great band to see in person. For more information, go to www.robgarcia.com. CT residents, be aware - the Rob Garcia 4 plays The Side Door Jazz Club in Old Lyme on Thursday July 10. Go to thesidedoorjazz.com for ticket information. Pianist/composer John Chin, a native of Korea who was raised in Los Angeles, has just issued his 2nd CD as a leader (his debut, "Blackout Conception", was released in 2008 on Fresh Sound New Talent). "Undercover" is a self-produced disk from sessions held in May of 2010 and finds the pianist in the company of drummer Dan Rieser and bassist Orlando Le Fleming. At the time of the taping, the trio had been playing together for some time and Chin wanted to document its progress. The 3 musicians worked in one room with no preconceived arrangements; the results are quite impressive. Juan Tizol and Duke Ellington's "Caravan" is given quite a funky backbeat, a cross between Ramsey Lewis and The Bad Plus. The pianist's polyphonic improvisations (basically, the right and left hands playing several line at the same time) give the trio a full sound. 3 of the other "covers" on the recording were penned by saxophonists including 2 by Wayne Shorter ("Edda" and "Fall") plus John Coltrane's "Countdown." Shorter's "Fall", recorded by Miles Davis on the "Nefertiti" Lp, has great drive, rightfully capturing the mood that composer intended but giving more of a pronounced backbeat. Rieser and Le Fleming lock in nicely, giving Chin the foundation he needs to explore the harmonic possibilities. The counterpoint created by the interaction of the piano and bass on Charlie Chaplin's exquisite "Smile" as well as the drummer's playful exploration of the rhythm makes for excellent listening. Chin supplies 3 original pieces including the sweetly melodic title track that, at times, has the sound and feel of a Bruce Hornsby composition. Chiming piano chords introduce "If For No One", a tune that blends a Brazilian feel with a classically inspired melody. After the introduction and theme, Chin's solo rises out of the lower end of the keyboard, building in intensity before the pianist steps aside for the bass solo. "Seemingly" is a imposing ballad and a piece where Le Fleming's strong feel for melody meshes well with that of the pianist. Again, it's no secret that there are, seemingly, thousands of piano trio recordings released each year. Don't miss hearing "Undercover", especially for the intense group interactions and the impressive choice of material. John Chin may have waited 4 years to release this CD; his patience and belief in his musical vision makes this project stand out. For more information, go to www.johnchin.com. Give the music a listen by clicking on the Bandcamp link below. Tenor saxophonist/composer Gianni Gagliardi, born in Barcelona, Spain and now living in Brooklyn, opens his debut CD "Nomadic Nature" with the sound of rain and thunder. The song, "Paris", rises out of those sounds with a haunting circular melody that is pushed forward by the drive of Mark Ferber's drums, the throbbing bass lines of Alexis Cuadrado, the 2-handed chords of pianist Luke Marantz and hypnotic guitar work of Gilad Hekselman. The youthful leader (25 at the time of these sessions) pushes forward with a solo that stays in the middle of his range, displaying the influence of Mark Turner. He takes a more playful approach on "L'ironie D'une Jolie Prisse De Tete" (roughly translated as "the irony of a pretty headache") with the melody have a smattering of Iberian colors resting atop the electric piano chords. "Macanudo Man" opens in a style reminiscent of Weather Report in its "Mysterious Traveler" phase, the major difference being Hekselman's probing guitar lines. The "grungy" guitar and distorted electric piano sounds give "Varicela Patagonia" a harder edge and the leader takes advantage of the "heaviness" of the chords to heft to his solo. Perhaps, the most impressive piece is the handsome ballad "Margolinda" that opens with an impressionistic unaccompanied piano solo that leads to the finely constructed saxophone melody. Marantz takes a solo that moves away from that melody line while Gagliardi sticks fairly closely to the chord structure. The strength of the piece lies both in the strong melody but also in the propulsive work of Ferber and Cuadrado (the guitarist sits out for this performance). "Nomadic Nature" speaks to the fact that young Gianni Gagliardi has already traveled far and wide. He's well on his way to discovering his "sound", aided greatly on this project by an excellent ensemble. As he continues to mature, one hopes he does not lose that inquisitive side of his song creation and lyrical nature to his saxophone playing. For more information, go to giannigagliardi.com.